MSR Luminaries interview, and feature. Here is a link to our paper describing the White Space Deployments in Africa. The Economist article on FarmBeats. IoT Applications (FarmBeats): Leading research on the end-to-end design of IoT Applications. Started the FarmBeats project with a focus on Agriculture. Read the Economist article here. Battery Research at Microsoft: Leading this effort since 2011. Shipped several innovations in products, such as Visual Studio and Windows. Two key research themes are: offload (MAUI, WearDrive, Somniloquy) and new battery architectures, e.g. Software Defined Batteries. TV White Spaces (Research site): Started this project in 2005. Awarded MIT TR-35 for this research. Now working on worldwide deployments and policy. Low Latency Wireless: Designed the XBOX One Wireless Controller Protocol. This is shipping on 10s of millions of XBOX consoles and controllers. VirtualWiFi: Ph.D. Thesis. This has led to the design of Wi-Fi Direct. Software has over half million downloads. Ranveer Chandra is a Principal Researcher at Microsoft Research where he is leading an Incubation on IoT Applications. His research has shipped as part of multiple Microsoft products, including VirtualWiFi in Windows 7 onwards, low power Wi-Fi in Windows 8, Energy Profiler in Visual Studio, Software Defined Batteries in Windows 10, and the Wireless Controller Protocol in XBOX One. He is active in the networking and systems research community, and has served as the Program Committee Chair of IEEE DySPAN 2012, and ACM MobiCom 2013. Ranveer started the FarmBeats project at Microsoft in 2015, and has been leading it since then. He is also leading the battery research project, and the white space networking project at Microsoft Research. He was invited to the USDA to present his work on FarmBeats, and this work was featured by Bill Gates in GatesNotes, and was selected by Satya Nadella as one of 10 projects that inspired him in 2017. Ranveer has also been invited to the FCC to present his work on TV white spaces, and spectrum regulators from India, China, Brazil, Singapore and US (including the FCC chairman) have visited the Microsoft campus to see his deployment of the world’s first urban white space network. As part of his doctoral dissertation, Ranveer developed VirtualWiFi. The software has been downloaded more than 750,000 times and is among the top 5 downloaded software released by Microsoft Research. It is shipping as a feature in Windows since 2009. Ranveer has published more than 80 papers, and filed over 100 patents, more than 85 of which have been granted by the USPTO. His research has been cited by the popular press, such as the Economist, MIT Technology Review, BBC, Scientific American, New York Times, WSJ, among others. He has won several awards, including best paper awards at ACM CoNext 2008, ACM SIGCOMM 2009, IEEE RTSS 2014, USENIX ATC 2015, and Runtime Verification 2016 (RV’16), the Microsoft Research Graduate Fellowship, the Microsoft Gold Star Award, the MIT Technology Review’s Top Innovators Under 35, TR35 (2010) and Fellow in Communications, World Technology Network (2012). Ranveer has an undergraduate degree from IIT Kharagpur, India and a PhD from Cornell University. For a more detailed CV, click here. 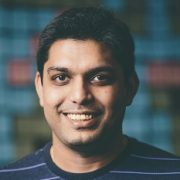 Souvik Sen (Duke, 2012, now at HP Labs). 2016: MAC & PHY design for long range wireless communication. Also, using RF to sense soil. I work closely with product teams within Microsoft. Some of the publically disclosed engagements are listed below. Designed the high-throughput, low-latency wireless protocol that shipped in the XBOX One. Research and industry has always focused on getting higher throughput. However, little prior work, if any, looks at achieving high throughput while achieving low (guaranteed) latency. For the XBOX One we designed a protocol that achieves both. I enjoyed being deeply involved with the design, development, and testing of the controllers. Described here, and also showcased in Steve Ballmer’s Build Keynote: (around 45th minute). Our research paper Empowering Developers to Estimate App Energy Consumption, published in ACM MobiCom 2012 describes the details of the system. Increases battery lifetime in Windows 8 Tablets and Surface computers. We helped design the antenna placement on tablet devices. Since users hold tablets differently than laptops, existing antenna placement techniques (on the laptop’s screen) are not the most optimal for tablets. The placement of a user’s hand around the antenna might reduce the signal, and so can the orientation in which the tablet is held. We studied these phenomena in detail – in the wild and in antenna chambers – and made recommendations to the Windows 8 team, which were incorporated in the final design of Windows 8 tablets. Poorly written apps are one of the primary reasons for high energy drain on mobile devices. One reason for energy-inefficient apps is that app developers do not have sufficient tools to determine the energy impact of their apps. As part of a Wattson research project we designed a Visual Studio plug-in that provides visibility to the application developer of their application’s energy consumption. Our paper Empowering Developers to Estimate App Energy Consumption, published in ACM MobiCom 2012 describes the details of the system. This work formed the basis for the Energy Profiler that is part of the Visual Studio SDK for Windows Phone 8. White spaces profer to be a possible solution towards improving spectrum effiency. As part of our research since 2005, we developed a geo-location database service which returns a list of TV channels at any given location, and filed to be a white space database provider with the FCC. We are also working with governments outside the US with white space trials. We recently released a version of our database as part of the ongoing white spaces trial in Singapore. We designed a technique to virtualize wireless LAN (WLAN) cards. With it users can concurrently connect to multiple Wi-Fi networks using a single WLAN card, thus enabling several novel scenarios. The original paper. The original paper ( MultiNet: Connecting to Multiple IEEE 802.11 Networks Using a Single Wireless Card) was published in INFOCOM 2004. Our miniport driver was downloaded by over hundred thousand developers and was one of Microsoft Research’s most popular software downloads. Virtual Wi-Fi first shipped in Windows 7. Video Links: An overview of my research is available in this MSR Luminaries Video. Some other video links are here: on white spaces, on improving battery life, and on code offload. In the past I have worked on wireless management, mesh networks, enterprise network management, and different wireless architectures. More details about some of the projects are below. We started the KNOWS project at Microsoft Research in early 2006, and since then I have led the technical aspects of the project through three versions. In the first phase, we looked at the MAC protocol for white spaces in a mesh setting. In the second phase, we proposed WhiteFi, a system for providing Wi-Fi like connectivity for white spaces. In the third phase, we have now built and deployed a white space network in Microsoft campus. More details on this project can be found here. “KNOWS: Kognitiv Networking Over White Spaces”, Yuan Yuan, Paramvir Bahl, Ranveer Chandra, Philip A. Chou, Ian Farrel, Thomas Moscibroda, Srihari Narlanka, Yunnan Wu. Proceedings of IEEE DySpan, Dublin, April 17-20, 2007. I am working on ways to reduce the energy consumption of PCs and mobile phones. Somniloquy (NSDI 2009) provides a way to let PCs go to sleep mode without losing network connectivity. Cell2Notify is a notification architecture for mobile phones that allows devices to turn on Wi-Fi only when needed, thereby increasing their battery lifetime. This is an active project, and expect to see more information soon. “MAUI: Making Smartphones Last Longer with Code Offload”, Eduardo Cuervo, Aruna Balasubramanian, Dae-ki Cho, Alec Wolman, Stefan Saroiu, Ranveer Chandra, Paramvir Bahl, Proceedings of ACM MobiSys 2010, June 15-18, 2010. With the increasing complexity of enterprise networks, there is a pressing need for efficient approaches to detect, localize, diagnose and repair faults in the network. I have worked on several aspects of network management as part of a bigger project, called NetHealth. Sherlock uses dependency analysis to localize faults that impact end-users, DAIR helps IT administrators locate regions of poor WLAN coverage and performance, and WiFiProfiler enables users to collaborately diagnose Wi-Fi problems. “A Location-based Management System for Enterprise Wireless LANs”, Ranveer Chandra, Jitendra Padhye, Alec Wolman, Brian Zill. Proceedings of USENIX NSDI, Cambridge, April 11-13, 2007. “Discovering Dependencies for Network Management”, Paramvir Bahl, Paul Barham, Richard Black, Ranveer Chandra, Moises Goldszmidt, Rebecca Isaacs, Srikanth Kandula, Lun Li, John MacCormick, David A. Maltz, Richard Mortier, Mike Wawrzoniak, Ming Zhang. Proceedings of HotNets-V, Irvine, November 29-30, 2006. “WiFiProfiler: Cooperative Diagnosis in Wireless LANs”, Ranveer Chandra, Venkata N. Padmanabhan, Ming Zhang. Proceedings of ACM/USENIX MobiSys, Uppsala, June 19-22, 2006. “Enhancing the Security of Corporate Wi-Fi Networks Using DAIR”, Paramvir Bahl, Ranveer Chandra, Jitendra Padhye, Lenin Ravindranath, Manpreet Singh, Alec Wolman, Brian Zill. Proceedings of ACM/USENIX MobiSys, Uppsala, June 19-22, 2006. “Architecture and Techniques for Diagnosing Faults in IEEE 802.11 Infrastructure Networks”, Atul Adya, Paramvir Bahl, Ranveer Chandra, Lili Qiu. Proceedings of ACM Mobicom, Philadelphia, September 26-30, 2004. Smartphones are becoming extremely popular. While they provide a new and unique user experience, several key problems need to solve to fully realize their potential. First, RF spectrum is limited, and a proliferation of smartphones has led to significantly degraded performance. This is likely to become worse in the future. Second, battery technology is not evolving at the same pace as applications, and the energy-hungry applications on a smartphone quickly drain its battery. With these constraints in mind, I have been working on technologies and applications to make better use to the RF spectrum while consuming lesser energy. “Virtual Compass: Relative Positioning to Sense Mobile Social Interactions”, Nilanjan Banerjee, Sharad Agarwal, Paramvir Bahl, Ranveer Chandra, Alec Wolman, Mark Corner, Proceedings of Pervasive, May 17-20, 2010. “Wi-Fi Neighborcast: Enabling Communication Among Nearby Clients”, Ranveer Chandra, Jitendra Padhye, Lenin Ravindrananth. Proceedings of ACM HotMobile, Napa Valley, February 25-26, 2008. “BeaconStuffing: Wi-Fi Without Associations”, Ranveer Chandra, Jitendra Padhye, Lenin Ravindrananth, Alec Wolman. Proceedings of IEEE HotMobile, Tucson, February 26-27, 2007. I have worked on networking issues in layer 2 and layer 3 (both on unicast and multicast) in wireless mesh networks. The details of this project are available on our group’s Mesh Networking page. “Context Based Routing: Technique, Applications and Experience”, Saumitra M. Das, Yunnan Wu, Ranveer Chandra, Y. Charlie Hu. Proceedings of USENIX NSDI, San Francisco, April 16-18, 2008. “Routing with a Markovian metric to promote local mixing”, Yunnan Wu, Saumitra M. Das, Ranveer Chandra. Proceedings of IEEE INFOCOM Minisymposium, Anchorage, Alaska, May 6-12, 2007. “Routing with a Markovian metric to promote local mixing”, Yunnan Wu, Saumitra M. Das, Ranveer Chandra. Microsoft Research Tech Report, MSR-TR-2006-158, November 2006. “Optimizing the Placement of Integration Points in Multi-hop Wireless Networks”, Ranveer Chandra, Lili Qiu, Kamal Jain, Mohammad Mahdian. Proceedings of IEEE ICNP, Berlin, October 6-8, 2004. “SSCH: Slotted Seeded Channel Hopping for Capacity Improvement in IEEE 802.11 Ad-Hoc Wireless Networks”, Paramvir Bahl, Ranveer Chandra,John Dunagan. Proceedings of ACM Mobicom, Philadelphia, September 26-30, 2004. “A Mesh based Robust Topology Discovery Algorithm for Hybrid Wireless Networks”, Ranveer Chandra, Christof Fetzer, Karin Hogstedt. AT&T Labs Tech Report and Proceedings of Informatics, 1st International Conference on Ad-hoc Networks and Wireless, Toronto, Vol. 16, pp 1-16, September 20-22, 2002. “Providing a Bidirectional Abstraction for Unidirectional Ad Hoc Networks”, Venugopalan Ramasubramanian, Ranveer Chandra, Daniel Mosse. Proceedings of IEEE INFOCOM 2002, New York, June 23-27, 2002. “Anonymous Gossip: Improving Multicast Reliability in Mobile Ad-Hoc Networks”, Ranveer Chandra, Venugopalan Ramasubramanian, Kenneth P. Birman. Proceedings of the 21st International Conference on Distributed Computing Systems(ICDCS), Phoenix, April 16-19, 2001. Wi-Fi is designed as a convenient replacement for the wire, and its design mostly attempts to mimic the behavior of the Ethernet. For example, a Wi-Fi card needs to associate to an Access Point (AP) before it can send data packets, which is similar to the action to plugging the Ethernet cable in the wall. Furthermore, Wi-Fi restricts a card to associate to at most one AP. In my opinion, the wireless medium has a number of powerful properties and wireless networks should be treated differently from traditional wired networks. I have built some systems that try to break away from these constraints in Wi-Fi networks as part of VirtualWiFi and WiFiAds projects. “MultiNet: Connecting to Multiple IEEE 802.11 Networks Using a Single Wireless Card”, Ranveer Chandra, Paramvir Bahl, Pradeep Bahl. Proceedings of IEEE Infocom 2004, Hong Kong, March 7-11, 2004.